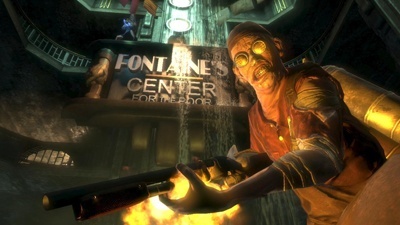 In response to heavy complaints about DRM for its upcoming BioShock 2, 2K Marin has scaled back its DRM plans. Last week, we learned that the hotly anticipated BioShock 2 would contain the hated SecuROM DRM (and install limits), plus Games For Windows Live install limits on top of that. The reaction from PC gamers was decidedly less than happy, prompting representatives to try and explain how it wasn't quite so bad as it seemed. It seems as though this wasn't enough to silence this particularly squeaky wheel, though, as complaints have continued. Complaints have continued so fervently, in fact, that 2K Marin seems to have given in to the pressure, quoth a BioShock 2 blog post. "Because of this feedback," said the representative in question (read: complaints), "we are scaling back BioShock 2's DRM." Scaling back doesn't mean completely removed, of course, but here's what's gone: "There will be no SecuROM install limits for either the retail or digital editions of BioShock 2, and SecuROM will be used only to verify the game's executable and check the date. Beyond that, we are only using standard Games for Windows Live non-SSA guidelines, which, per Microsoft, comes with 15 activations (after that, you can reset them with a call to Microsoft.)" This holds true for both digital and retail versions of BS2, which the representative pointed out now had DRM equal to that of Eidos' Batman: Arkham Asylum, a game that many had pointed out as doing a much better job of the whole thing. Unfortunately, that seems to only be referring to the actual traditional DRM - presumably pirating BioShock 2 won't get you a gimped Big Daddy (that is a sentence I never thought I'd ever have to write). So, what do you think? Is it enough to quell the irritated PC masses? Or is it still not good enough?